The following article about the Trinchera Residency is from the Medicine Man Gallery site. I migrated it to this blog to insure preservation of the entry. It was a great experience and I look forward to the Trinchera reunion. 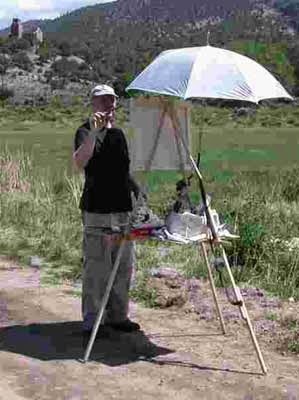 In August 2006 I was one of fifteen artists invited to a painting residency at Forbes Trinchera Ranch in southern Colorado. Forbes Trinchera is a 400 square mile ranch founded by Malcolm Forbes. We were invited by Kip Forbes to paint the valley and mountains he loves. In addition to paying all expenses Kip Forbes is providing a venue for our work at the Forbes Gallery in New York City. American Artist magazine, which co-sponsored the trip, will run an article on the show and the residency. Our primary job at the ranch was to collect visual information–paintings, sketches, or photos–to create works of art for the show at Forbes Gallery in March. I was perhaps too optimistic and brought a van-load of huge canvases. Although there were moments of sunshine the week was dominated by quickly shifting weather conditions punctuated by downpours. Since I’m used to the nearly perpetual sun of Utah it wasn’t easy for me to adjust. I initially responded by succumbing to an artist’s version of writer’s block. I knew I had a limited time to collect usable reference so I adapted by switching from painting to sketching. It was the right strategy and I produced a handful of great sketches I can use to make woodcuts for the March show. After three days of sketching I adjusted to the weather conditions and was able to paint a few usable paintings. I had to remind myself that plein air painting is a means to an end and for me it is pointless to expect finished work in the field. I forced myself to embrace Robert Henri’s dictum that the principle aim of the artist is to achieve a state of mind where making good art becomes inevitable. Once I achieved that state of mind–or an approximation–I actually painted a few paintings worthy of frames. One of the most enjoyable aspects of the residency was the opportunity to meet so many incredibly talented artists. Just to be included with them was a great confidence booster. My wife Deb and I look forward to the show in March as much to see our fellow artists again as to see the show. I bought a new easel especially for this trip. It is a reproduction of the Gloucester easel used by artists such as Edward Redfield and is made by Take-It-Easel. I bought it so I could add a huge palette and avoid the constant cleanup I experience with my French easel. Although I did do some large paintings (24” x 36”) the easel worked just as well with my smaller 9” x 12” studies. If you want the flexibility of working large or prefer a large palette area I can strongly recommend the Take-It-Easel. It’s easy to carry and set up and performed admirably in a variety of weather conditions.